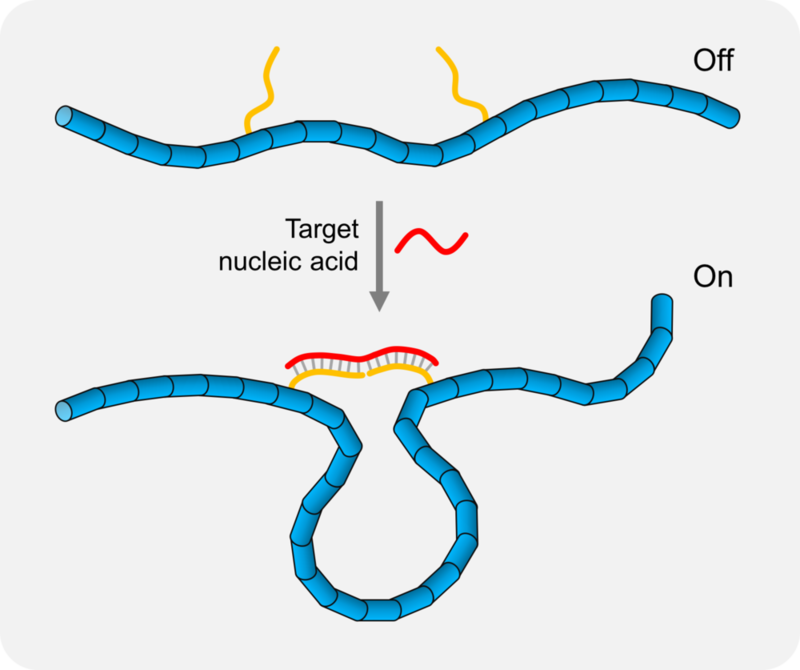 DNA nanoswitch operation: Hybridization of the target nucleic acid with the detectors causes a conformational change from linear to looped state. Some of my research involved designing and building DNA motifs and functionalizing them using different conjugation strategies. For example, DNA tiles (such as the one shown on the right) can be tailor-made to connect with other such motifs to form arrays. The component strands can be modified and attached to functional groups via strategies such as click chemistry. AR Chandrasekaran,* D Patel, M MacIsaac & K Halvorsen, Addressable configurations of DNA nanostructures for rewritable memory. Nucleic Acids Res. 45: 11459-11465 (2017). [PDF] Selected as journal cover. A DNA three-point-star that was modified to contain click reaction groups. Cartoon showing the self-assembly of a tensegrity triangle motif into a 3D crystal. Cylinders represent DNA double helices and sticky end connections are shown as half cylinders of same color..